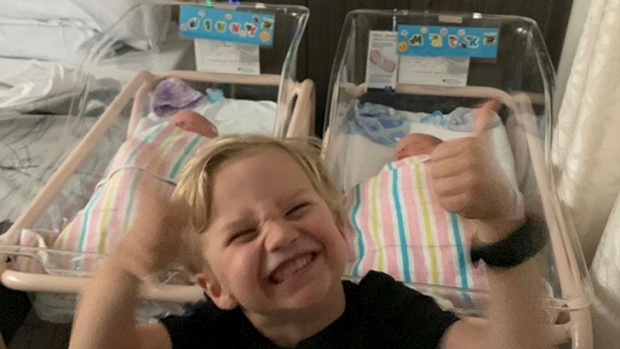 Jimmy Rees - or Jimmy Giggle as he's known to just about everyone in Australia - and his wife Tori have just welcomed twin baby boys, both celebrating the safe arrival of their bundles of joy in posts on Instagram. The twins named Mack and Vinny, grow the Rees family to five - also have 3-year-old son Lenny, who was born to the Giggle and Hoot tv presenter and his wife on April 7, 2015. Jimmy wrote, "THE BABIES ARE HERE!!!! Tori and I couldn't be prouder to share the safe arrival of Mack & Vinny (2.46kg & 2.33kg)," he wrote. "Both boys are doing amazing!! Tori is a total superstar, she was born to be a mummy and continues to surprise me with her innate ability to just know what to do!!! Our hearts have doubled in size!! Prepare for some serious baby spam!!!" Spam away Jimmy, we don't think anyone will mind. Take a look at the Insta album below for the cutest photos you'll see today, including Lenny looking adorably happy about his little brothers. Anyone who has just given birth will also fully identify with the plate of soft cheese and deli meat. For some of us it's sushi, and others oysters and pâté and now we know what Tori craved to eat during her twin pregnancy. She also took to Instagram, expressing her joy and alluding to their fertility struggles. "I would really like to take this time when I am sharing our families insanely special time to acknowledge the hardships so many families and women are going through in their own fertility journey. Jimmy and I had a very personal tough journey that is so important to acknowledge." Tori then conveyed a message to others going through fertility issues. "Those families who are struggling - please stay strong, please don't give up hope on that family, please get help in whatever way you can, please allow yourself to grieve and please speak up to people who understand - I am so right there for anyone who is going through a fertility journey of their own." She signed off, "So much love to everyone. I am feeling so full, so loved up and just so insanely BLESSED in every single possible way."